Erica Bunker | DIY Style! 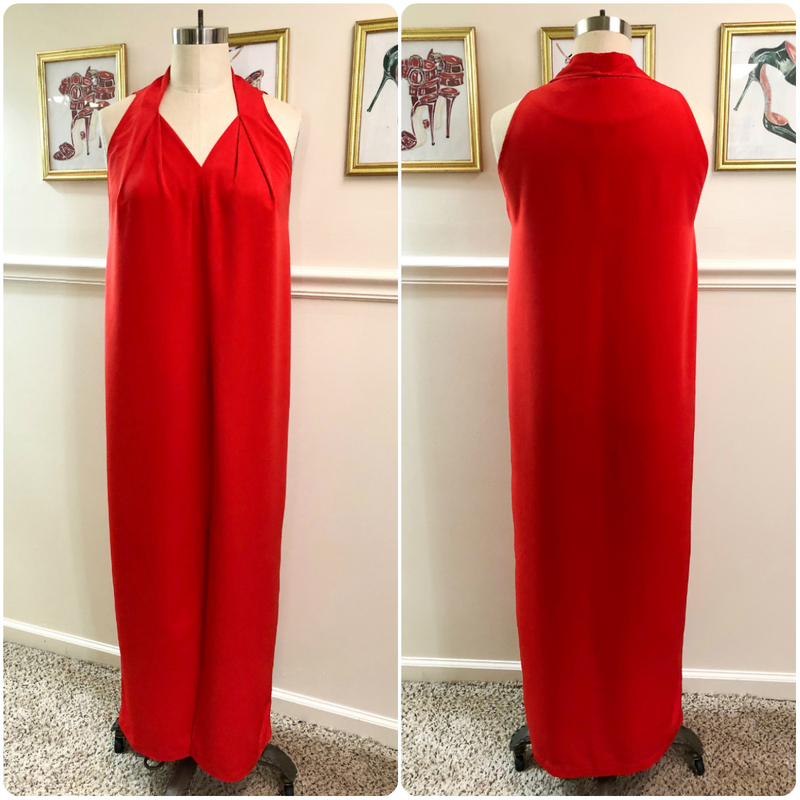 The Art of Cultivating a Stylish Wardrobe: Review: McCall's 7775 - Red Hot Maxi Dress! There is no other reason for me making this dress, other than I had some red fabric and this dress looked interesting. As a sewist, that's a damn good reason! When I bought McCall's 7775, I liked both versions. Usually when there are two different patterns in an envelope, the styles kind of go together. I don't see the cohesiveness in these two designs. That's not a bad thing... because I feel I got two dresses for the price of one. And I decided to go with view D first. Only because I didn't have a red invisible zipper on hand. I still plan to make the other one. My fabric is a red poly crepe, that I think is probably a peachskin that I purchased at Fine Fabrics. This fabric has no stretch, but the drape is incredible. It's as lovely as a 4-ply silk crepe. I cut the size 14 and graded to a 16 at the hip. I didn't have to add any additional length, because I plan to wear this dress with heels and flat sandals. 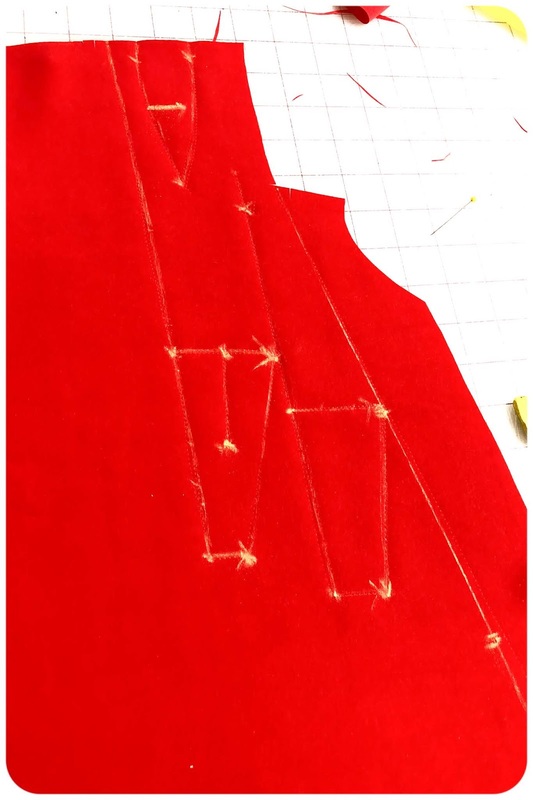 This pattern has only 3 pattern pieces (front, back and back facing). But don't be deceived that this pattern has no level of difficulty or lacks design interest. There is a lot of pleating and I carefully transferred all of my markings, because there is no way you can wing this. The pleating and the interesting collar is why I was drawn to this dress. And also, it has really good cut-in shoulders. 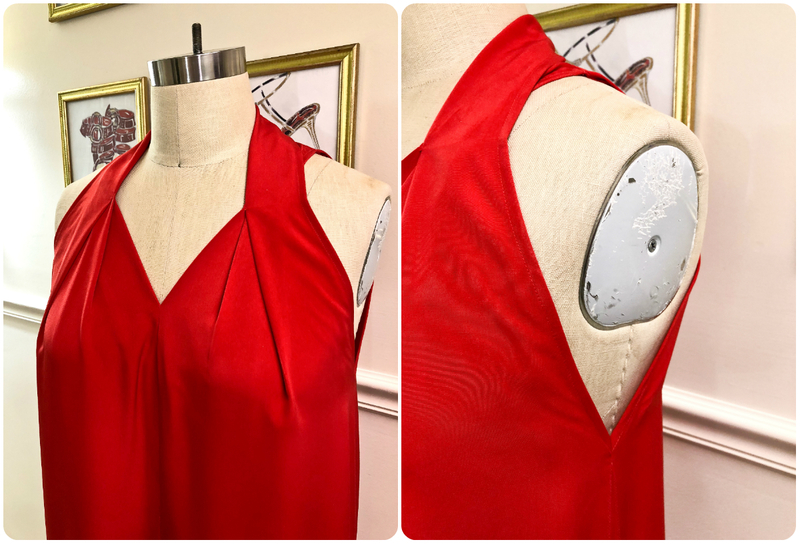 Even the armhole has a nice style, and it's not too low that your bra will show. There is a center front seam that ends in a slit. You can adjust that to your own particular comfort level. This dress is unlike anything I have in my closet. And it's also a machine-washable pullover. Plus, it looks just a great with flat sandals. So, I plan to really enjoy wearing this. Sizzling! It looks fantastic, love the drama of a long red dress. Lovely color, lovely dress! It looks so beautiful on you. Red is certainly your color! Great dress to show off how hard you've been working out at the gym. This dress really catches your eye! Beautiful! So I'm giving it a try, but am wondering about these pleats. After you baste them and press, then what? I don't find any instructions about sewing them in place with some top stitching or removing the basting... what holds them in place? Thanks in advance for your help.